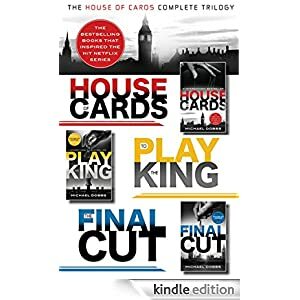 House of Cards: A dark tale of greed, corruption, and unquenchable ambition, House of Cards reveals that no matter the country, politics, intrigue and passion reign in the corridors of power. To Play the King: After scheming his way to power in House of Cards, newly elected Prime Minister Francis Urquhart takes on the new King. The Final Cut: Now Francis Urquhart is about to take his place in the record books as the longest-serving Prime Minister this century. Yet it seems the public is tiring of him at last, and the movement to force him from power is growing.